Brøndby Municipality has decided that five out of a total of 12 tower blocks built in the early 1970s should be torn down. The buildings in Brøndby Strand Parkerne have been condemned primarily because they have been found to contain large amounts of the hazardous chemical polychlorinated biphenyl (PCB), reports TV2 Nyheder. PCB was commonly used in buildings up to the start of the 1970s, frequently in coolants but also as plasticisers in paints and cements, stabilising additives in the coatings of electrical cables and electronic components, wood floor finishes and other things. It was subsequently found to be highly toxic and has been banned in buildings since 1977 and is now on the EU’s list of dangerous substances. As well as problems with PCB, the blocks are suffering from degenerating concrete and old installations, so the cost of renovation would be prohibitively high. Demolishing the tower blocks is expected to cost over 200 million kroner, but the cheapest renovation is estimated to cost around 780 million, according to boligen.dk. 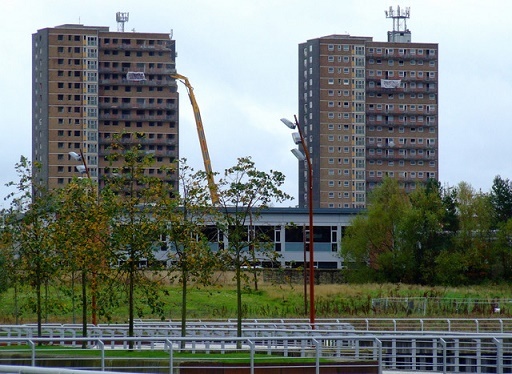 The demolition of the 16-storey blocks is due to start after the summer holidays and will take around two years. “The challenge is that there are other blocks close by. We will have to take them down in stages,” said Brøndby’s mayor, Kent Max Hagelund. There is a silver lining, though, as the mayor also points out the municipality will be able to build something else in the vacant space. “We’re actually working on a housing policy right now that we will be presenting at the end of the year to show how the area will look and what kinds of housing will be coming,” added Hagelund.